We’re finally home from our Irma evacuation trip. We don’t have power as of yet, but that seems like a small little inconvenience compared to the catastrophic impact that was predicted for our area. I mentioned in my favorite things post earlier this week that I’ve been making candles in my slow-cooker. The fact that I’m writing this post/tutorial just after a hurricane that knocked out millions of people’s electricity across Florida, including my home, seems very fitting. A few months ago, I decided to try making homemade candles again. Instead of reaching for a double boiler (or my pieced together version) and a pouring pot, I reached for my slow-cooker and mason jars. Just a couple of hours after spooning the wax into the mason jars, adding the jars to the slow-cooker, and filling the slow-cooker partially with water, the once hard wax turned into clear (soy) and golden (beeswax) liquid. Once the waxes melted in the mason jars, thanks to the consistent heat of the slow-cooker, I removed the jars and added the wicks to the jars. Within about two and a half hours (from start to finish), and a very minimal amount of hands-on time and tools, I made five homemade candles. Talk about easy, and there wasn’t any crazy mess involved. I shared a tutorial for making homemade candles, the traditional way, a couple of years ago. 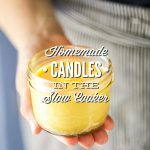 Today, let’s update the candle-making options with a tutorial on how to make homemade candles using the slow cooker. I think the appropriate title for this tutorial should be, The Mess-Free, Super Easy Way to Make Homemade Candles. Yes, let’s go with that! 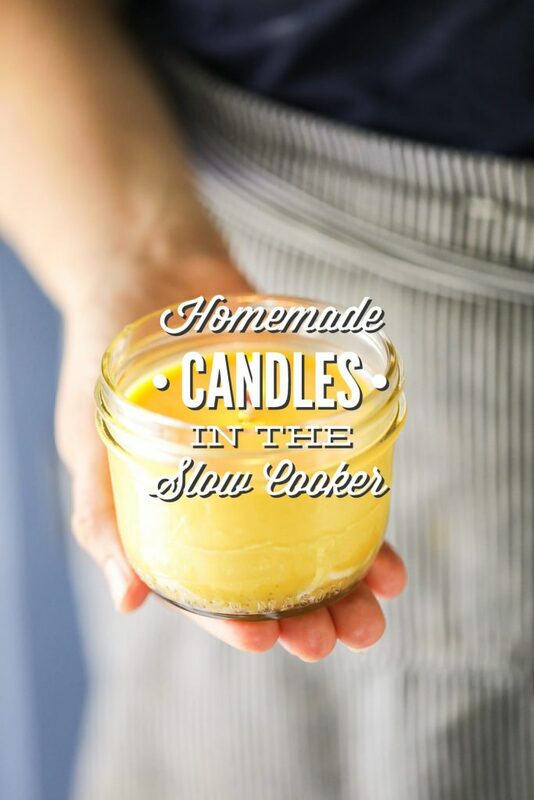 How to make easy, fuss-free, candles using a slow-cooker/crock-pot. Spoon the wax into the mason jars until full. 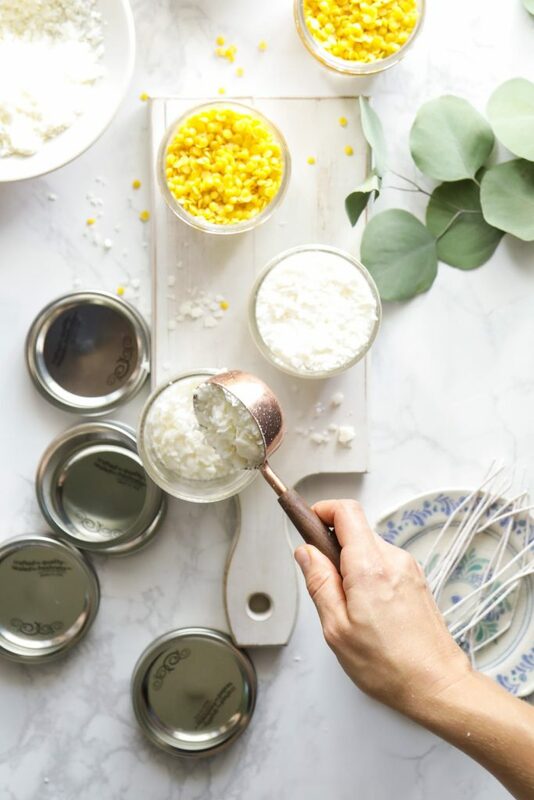 Using the back of a small measuring cup or large spoon, press the wax down in the jar as it gets closer to the top. Add more wax until the jars are full. At this point, you'll probably only need about 1 cup of wax. Place the filled jars in the slow-cooker base. Turn the slow-cooker on high. Add boiling water to the slow cooker, until it comes half-way up the exterior of the jars. Allow the jars to “cook” for 30-45 minutes, covered. After 30-45 minutes, the wax should begin melting. 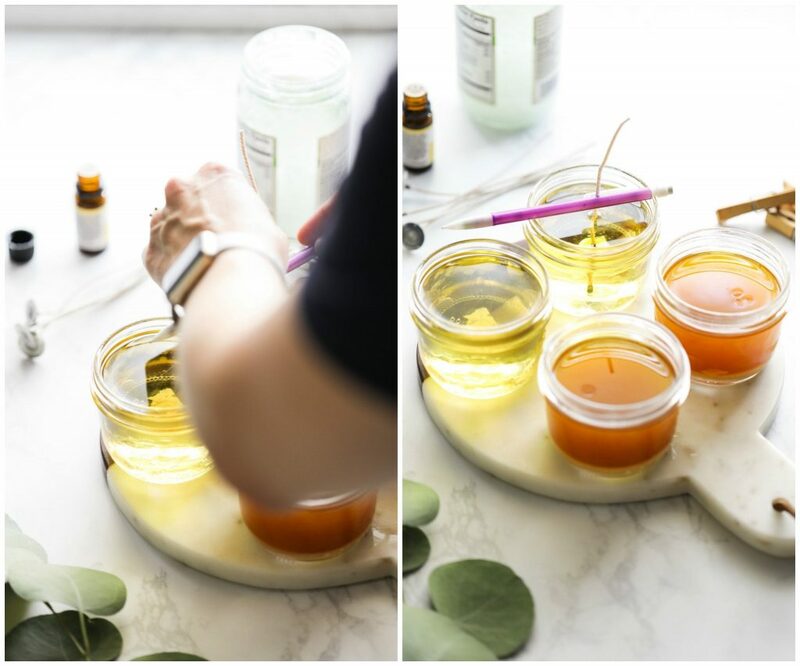 Add more wax, pressing the wax down with a small measuring cup or spoon until full. 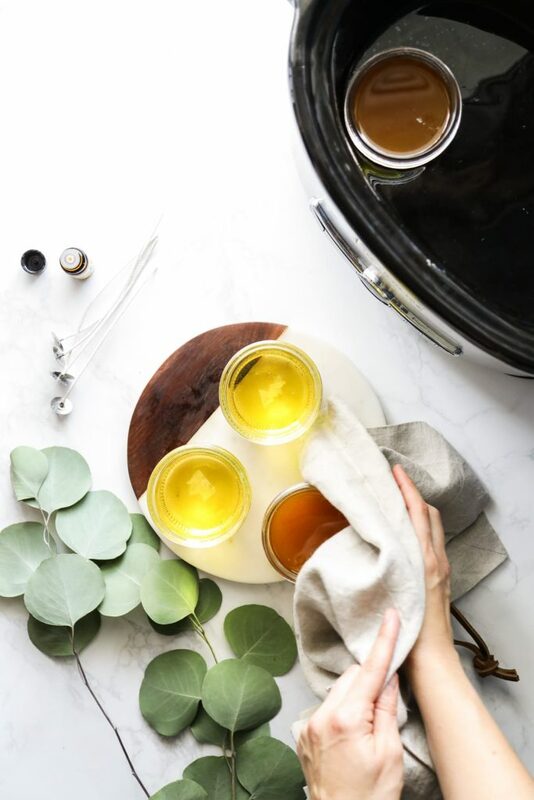 Place the lid on the slow-cooker and "cook" the jars for another hour (give or take a few minutes--soy melts quickly, beeswax takes longer to melt), until fully melted. Very carefully remove the jars from the slow-cooker. Let the candles rest for 10 minutes. 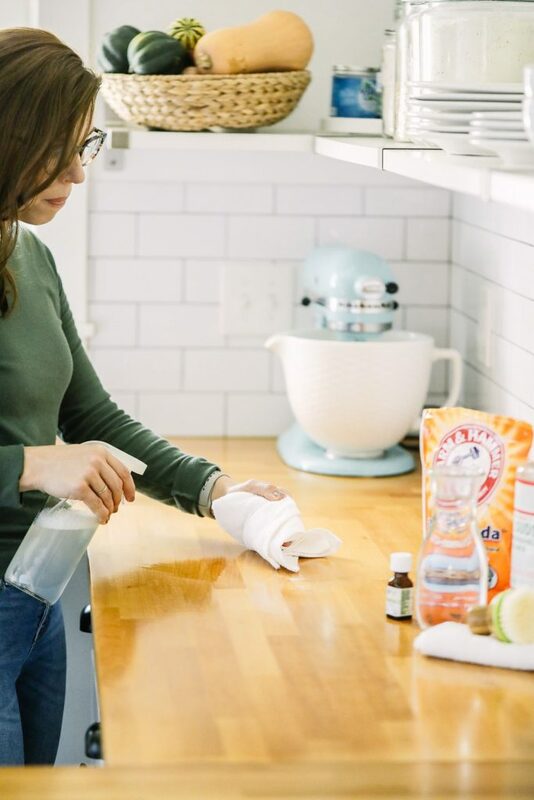 If you'd like to add essential oil, stir together 1 tsp of liquid coconut oil and 50 drops of essential oil. Pour the mixture into the candles and stir. Place the wicks in the jars, holding up the tops of the wicks with clothespins (or mechanical pencils or pens, using the clip portion)--this will keep the wicks from moving in the liquid wax. Let the candles rest until cool and solid (about 30 minutes). Once cool and solid, cut the top of the wicks to 1-inch. The candles are ready to use at this point. Hi Kristin, these candles look great! I’ve never been a fan of beeswax, but the colour looks really nice. Not owning a slow cooker, I was wondering if you could make this in a Dutch oven. Do you think that could work? I’ve also looked at your previous candle post with the double boiler, and I think I’ll give that a try. I have tons of Weck jars in storage that would be perfect for this. Hey Kiki, I think a Dutch oven would work perfectly! Just replace the water as needed, since it may evaporate due to the heat of the stove-top. Thanks! Already ordered the supplies and will make these with a friend as Xmas gifts – either in the Dutch oven or the double boiler method mentioned in your earlier post. Awesome, Kiki! These make great Christmas gifts! Should it be fractionated coconut oil? Hey Kailly, I use regular virgin coconut oil. Such good news, despite being without power, you and your family are well. Thanks for the update. This is amazing! I can’t wait to try this method! Candle making is always so messy. I would love to use beeswax, but the last time I made beeswax candles the wick wouldn’t burn/the flame would extinguish. Is there a special “beeswax” wick I should try? Thanks! So glad you and your family are safe! Hey Andrea, I think you’ll get about 2-4 ounce candles per pound of wax. I’ve had really good success with the ones I linked to on Amazon. They’ve worked really well for my beeswax candles. Hi Kristen! This is such a great idea. I cannot wait to try this out. I have a slow cooker that only has 2 settings — low temperature or high temperature. Which setting should I use? Was wondering how many candles would the one pound of beeswax make? Thanks for the tutorial! Can’t wait to try it! Praying for your family as you try to get things back to normal after such a scary time. Love love love this idea! I hate the mess that’s created with homemade candles. Brilliant! Yea, me too! Thank you, Erica! I’m wondering about condensation that would be produced by the water in the slow cooker. Does it not drip down from the lid and into the wax? Hey Gloria, That’s a great question. I was concerned about that, too, when I first started experimenting with this. From my experiences, there are some droplets, but nothing considerable enough to effect the candles in a bad way. You could also try leaving the lid off (it will probably just take a bit longer), or wiping the lid off as you go. If you’re making a bunch to store long-term, the water droplets could be an issue (? 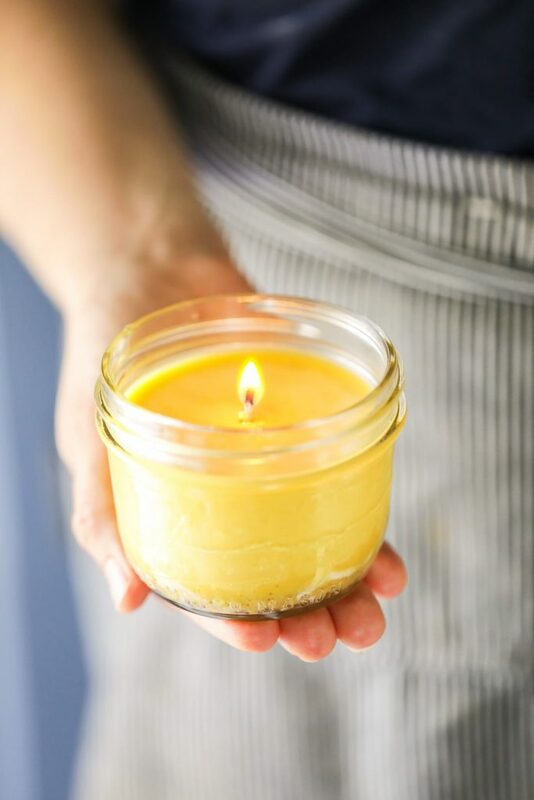 ), but the 4-ounce size jars burn pretty quickly if you use candles often so I haven’t had issues with the few droplets that may get inside the wax. Do you secure the wicks to the bottoms of the jars? Or does the wax hardening do the trick? Wondering how to get the base to the bottom when already fill of wax. Thanks! Hey Gillian, I just set the wicks in the wax, making sure the metal base is on the bottom of the jar, and then secure the top with the clothespin or pencil so nothing moves. I think this would be much harder with a wick that doesn’t have a metal base–like the ones I use. The wax starts to harden from the bottom of the jar, so you could wait until you notice that it’s becoming cloudy (hardening) and then insert the wicks so there’s a bit more to “catch” and set the wicks. Does that makes sense? Excited to make these as holiday gifts! Any EO scent suggestions? Hey Emily, I like blends, particularly the new Spiced Orange blend from Plant Therapy: https://www.planttherapy.com/synergies. Am I correct that the 1 tsp of oil and 50 drops of essential oil is for all 5 jars. I know silly question. Hey Carolyn, The recipe is per jar, so that is for one jar :). The example of 5 jars is how many fit in my slow-cooker. Gotcha, glad I asked. Can you tell me why the coconut oil with the essential oil..
I’ve found the coconut oil helps to disperse the essential oil better. Kristin, thank you so very much. I’m new at this and appreciated your quick response. I am going to make these with my granddaughter she loves crafts. We did your lip balm awhile back with cinnamon oil. Her favorite. Was lots of fun. Have you tried this with 8 oz. jars? Thanks so much for sharing! Hey Ashley, I haven’t, but I bet they’d work great. You’ll just need to increase the “cooking” time. This looks like such a good gift idea! 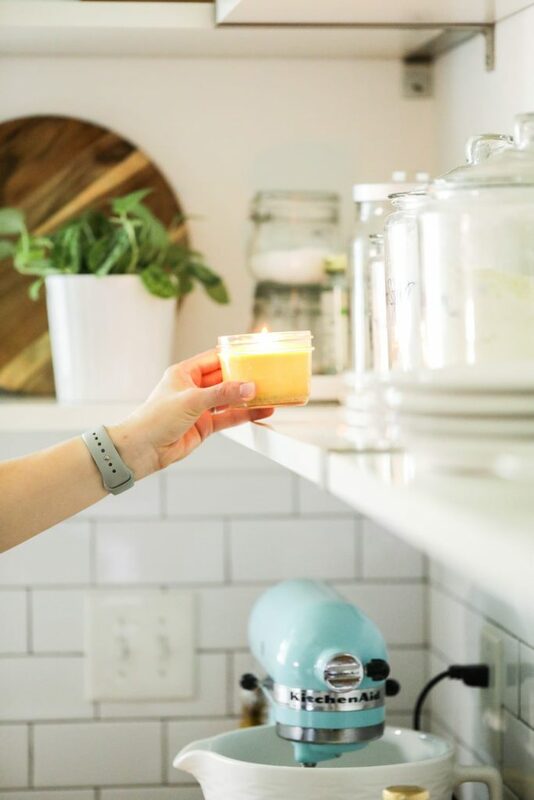 Do you know if there’s a way to add more than just a slight sent to the candle? 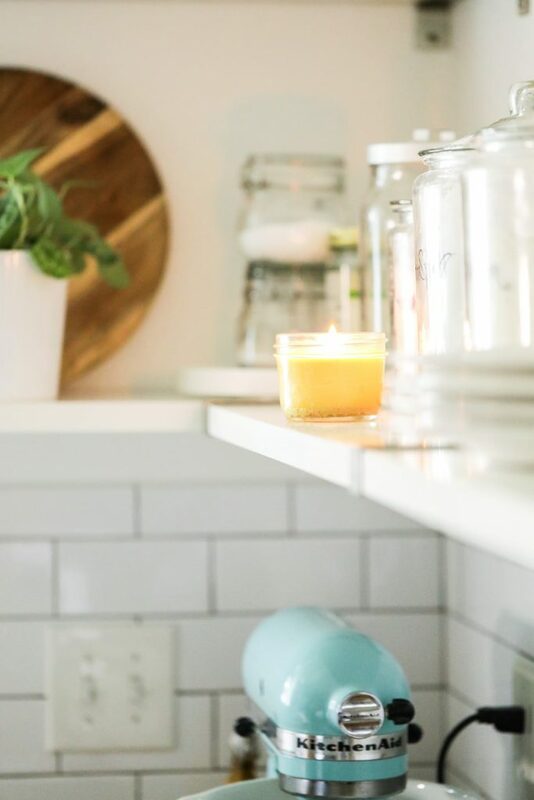 Would you just add more oil to the candle or would you need to use something else? Thanks again for sharing this great idea! Hey Kathleen, You could add more essential oil, or try a fragrance oil–not sure how natural fragrance oils are but that’s all I can think of. This was the most rewarding Saturday activity I’ve done in a long time. I made them in 16 oz mason jars, which surprisingly didn’t need any additional “cooking” time because the soy wax melted so quickly. The only difficulty I had was in getting the silly mechanical pencils not to roll over and thus bow the wick in the liquid wax. I’ll try clothespins for my second draft. This time I used peppermint and eucalyptus in one jar and cedarwood and bergamot in the second jar. They turned out GREAT, and they were SO simple! Five minutes of work to get eighty-ish hours of burn time? I’m never buying a candle again. THANK YOU Kristin. Thank you for sharing a photo, Evey. Those looks amazing. I love the tall jars. So glad you enjoyed making them. After a week of use, I realized I wasn’t fully satisfied with the amount of scent from each candle. In my first draft each 16-ounce jar got 60 drops of primary scent and 30 drops of secondary scent. The result was on the mild side for my liking. So I re-melted the candles in the slow cooker, topped up the wax in each, and added a couple dozen additional drops. Success! If I didn’t already love this craft for its productivity and affordability, I’d love it for its flexibility. This one is a real winner. That’s awesome, Evey! Thanks for coming back and sharing your scent success. I’m so glad you were able to make it work. I made these recently in 5oz Oui Yogurt jars that I saved. Came out perfect. My only problem was when I burned them there was no smell. I used 50 drops plus oil of Christmas Pine from Hobby Lobby. I’m wondering if my own oils from DoTerra would of given me more sent. Hey Carolyn, What a great idea to use those jars–they’re the perfect size. That’s pretty common with essential oils. The smell isn’t potent like a store-bought candles. Different essential oils may offer different scent potency, too. Carolyn-I have 30 of those cute little jars. Love them! Now I have something to do with them! 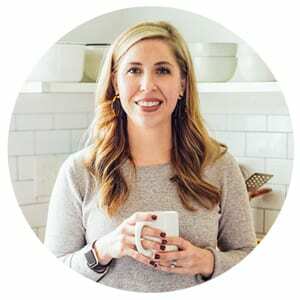 Hi Carolyn; I used ~7/8 of a 2-lb bag of soy wax flakes for (2) 16-ounce mason jars. After a week of burning, I decided to revise the candles scents and was able to use the remainder of the bag to “top up” both candles. Thanks and Happy Thanksgiving to all. My daughter-in-law had a box of these and we were trying to decide what to do with them. 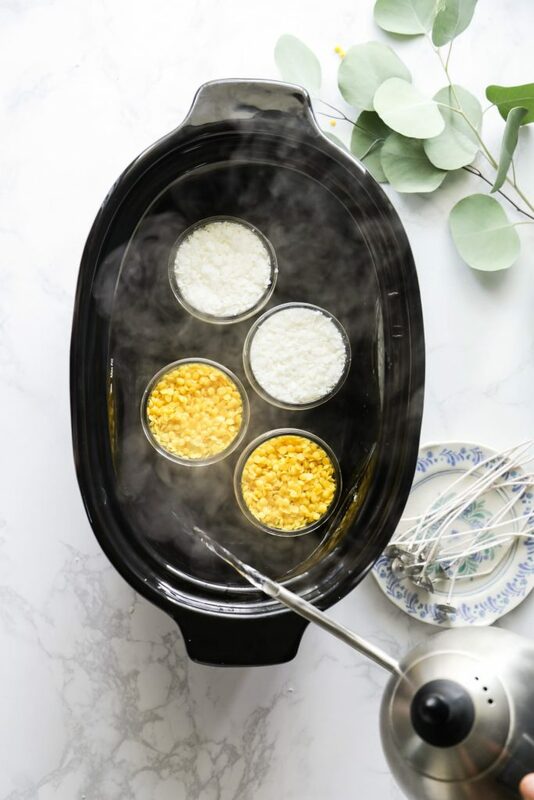 When I got my ‘livesimply’ e-mail showing how to make these crockpot candles I new exactly what we were going to use. Worked out perfect. ? I made these yesterday in tea cups I found at goodwill and they came out perfectly! No mess! Thank you so much!! Hey Deborah, You’ll add both at the end, when you’re removing the candles from the slow-cooker to cool them. I need to make travel candles. Can I use tin canisters instead of a mason jar or should I melt down in a mason jar then pour into them?